Superb one bedroom, one bath condo in Bellevue Park! 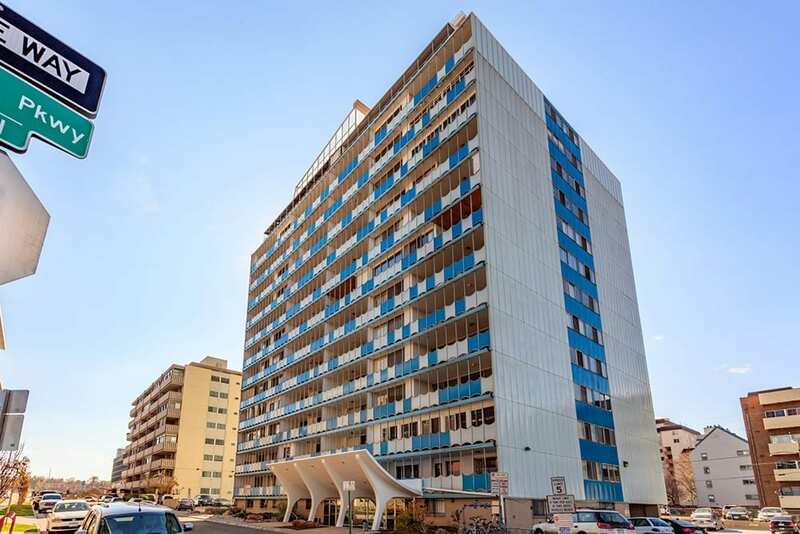 This retro, mid-century modern building is loaded with character and features a secured lobby, a rooftop pool, a fitness center, a clubhouse room, and a business room. A wraparound rooftop deck offers plenty of room to entertain and showcases breathtaking, 360-degree city and mountain views. Accommodating layout, perfect for hosting gatherings, features a spacious living room with access to the large covered balcony and an adjoining casual dining room open to the kitchen. Offering a cool retro vibe, the super cute kitchen maintains tile backsplash and a functional layout. Bedroom provides direct access to the balcony. Plenty of room for all the extras with two separate storage spaces. Shared laundry in the building is conveniently located on the same floor. Deeded parking space, off-street. Unbeatable location, just minutes to downtown and close to restaurants, Denver Botanic Gardens, Cheesman Park, City Park, and Cherry Creek!